With a fourth-grade education from the Marshall Street school in San Antonio, Jake Volz did his family proud. Born in the city of San Antonio on April 4, 1878 to parents who had immigrated from Germany a little over 10 years earlier, Jacob Phillip Volz took up baseball as a youth and broke in professionally in 1898 for the Texas League’s San Antonio Missionaries. In 1899, when the league was reorganized, Volz became “the first pitcher to sign with the new Texas League.”2 San Antonio’s team was the Bronchos; Volz appeared in 26 games, showing some versatility. He pitched in 13 games, played outfield in 12, and second base in one game. Batting was not his forte; he hit .176. On the mound, Volz was 7-6 in 111 innings. He struck out 43 and walked 39. Earned runs were not compiled, but he’d allowed 74 runs with a WHIP (walks and hits per inning pitched) of 1.351, thanks in good part to all those walks. Twelve of his 13 pitching appearances were complete games. What he did in 1900 is not clear; he wasn’t in organized baseball. The 1900 census lists him living in Quincy, Gadsden County, Florida. He is listed as an engineer and is a boarder in the home of newspaper editor Thomas Scott. Two other men living in the home are listed as baseball players but they do not appear to be in SABR’s minor-league database. Volz came to New England in 1901, playing for three teams during the baseball season. He began with the Portsmouth Browns in the Virginia-North Carolina League (Class C), but only briefly, listed as an infielder; SABR’s minor league database is not able to offer a statistical record, though Sporting Life reflects his pitching a nice three-hitter against Norfolk on May 14. He spent most of the year pitching in 19 games for the Manchester, New Hampshire team in the New England League. We don’t know how many he won, but he showed well enough that the Boston Americans signed him on August 16, asking him to report when Manchester’s season was over. Jake Volz’s major-league debut came on September 28, 1901. It was the last game of the year, the second game of a doubleheader at Boston's Huntington Avenue Grounds. Boston had won five games in a row, including an 8-3 victory in the first game. Game two was shortened by the onset of darkness, stopped after seven innings. In those seven innings, Volz had surrendered seven earned runs and two unearned ones. He’d only given up six hits, but he’d walked nine – and two of the hits were home runs. He struck out five of the 35 batters he faced. The Boston Globe spelled his name phonetically: “Voltz, the Manchester pitcher, was given a trial in the second game and proved very wild, giving nine bases on balls. He had a 'sweet william' delivery, that was taught him by some scientific man, but the conditions were not right and his kite was continually snapping off its tail.”3 The paper pointed out that after Milwaukee had scored five runs in the top of the first inning, by rights they should have won the game. But their own pitcher, Bill Reidy, was hit even harder - the seven-run fifth inning giving Boston the edge. Chick Stahl's two-run bases-loaded single and a three-run homer by Jimmy Collins, one of two homers that Boston's player/manager hit in the game. The Globe also called Volz (getting the spelling right a few paragraphs later) a “slow-going ‘old’ youngster.” He walked three of the first four batters he faced, and gave up a single to the other one. Wid Conroy's triple made it 4-0; Conroy scored on an error by Parent at shortstop. In the second inning, Davy Jones hit “the longest hit ever made on the grounds” for the first of Milwaukee's two home runs. Despite his 9.00 ERA, and nine runs allowed, Volz won the game, since his teammates had scored 10 times. Volz hadn’t helped offensively; he was 0-for-4 at the plate. As a fielder, he had two chances and flubbed them both. Nonetheless, he pocketed the win, and was 1-0 as a big leaguer. The doubleheader had drawn 5,388 fans. Boston’s record was 79-57, finishing in second place, four games behind the league-leading Chicago White Sox. Manchester welcomed Jake back to Varick Park in 1902, and he put up a 19-7 record for manager John A. “Phenomenal” Smith (Volz’s obituary in The Sporting News says his record was 26-8, though the same obituary claims his major-league record in 1905 was 0-3, rather than the 0-2 in the record books. Sporting Life reports his record as 21-10. )4 The team finished first in the New England League, now a Class-B league, and led the league in strikeouts with 220. He hit a home run himself, but overall was .147 as a batter. Volz joined in a shutout in the May 13 game and, despite five walks, threw another shutout against Lawrence 10 days later. He had a two-hitter against Lawrence in August and closed the season with a four-hit 2-1 win over Concord. Despite his wins total, there was a reputation which seemed to have attached to him: early in the year, sportswriter Tim Murnane dubbed him "’base on balls’ Volts. "5 Murnane, in addition to being the principal reporter covering baseball for the Boston Globe, was also the president of the New England League. 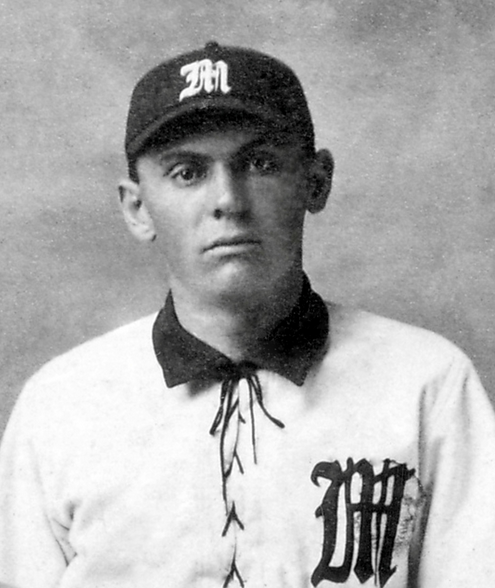 In December, Volz was signed for the 1903 season by the St. Paul Saints. He jumped his contract with Manchester, but they said no effort would be made to reclaim him. The Saints won the American Association pennant, but Volz was not with the team for long. St. Paul was reported to have released him to Duluth in mid-May, that he might return to Manchester, but later on it was reported that he had been farmed out to Winnipeg in early August.6 It doesn’t appear that he ever played for any of the three teams. On August 18, it was announced that his contract was assigned to the Indianapolis Indians, back in the American Association. It was an opportunity to return to the big leagues. Playing in the National League, Volz was given two starts but neither turned out well; he lost to the Giants, 16-3, on May 3 and 11-1 to the Pirates on May 24. He appeared in two other games in relief, finishing 0-2 with a 10.38 ERA. He was 5-5 with Manchester and Lawrence (the franchise moved to Lawrence, Massachusetts on July 20) in 1905, and spent some time with the Sioux City Packers (1-4) in the Western League. There was a little controversy in that he continued to pitch for Lawrence for some time after his trade in August for Garry Wilson. Volz filed a claim of some sort against Sioux City, but his claim was denied in early 1907.In 1906 and 1907 Volz returned to New England, playing in the Connecticut State League for Holyoke, Hartford, and Bridgeport (14-19 for the Holyoke (Massachusetts) Paperweights the first year, and with a combined 12-12 mark for the Paperweights, Senators, and Orators in 1907.) One of Holyoke’s three managers in 1906 was Jake’s teammate from the 1901 Americans, Tommy Dowd. There was a third return to the major leagues in 1908. Why, might be a good question, since he was 9-19 for the Columbia (South Carolina) Gamecocks in the South Atlantic League before joining the Cincinnati Reds in mid-August after throwing a couple of two-hitters on July 6 and 11. In 22 2/3 innings, he started four games for the Reds and appeared in three more (1-2, with a 3.57 ERA.) It was with Cincinnati that he collected his one and only big-league hit, a single, and drove in his only run. The hit came on August 16 in Cincinnati off George Bell of the Brooklyn Superbas. Volz started and won the game, his only National League win. He gave up five hits, three bases on balls, and struck out three in the 5-1 victory. He was 1-for-10 in the majors. Given two more chances in the field, he converted both successfully, so wound up with a lifetime .500 fielding percentage. He was released back to Columbia, returning back home to San Antonio after a couple of weeks. He’d begun the 1909 season with Charleston (South Carolina) but was released before the season began. He signed on with the Norfolk Tars and after a 14-12 season with the Class C Virginia League team, he moved to Canton in the Ohio-Pennsylvania League. In March 1910, he pitched some for San Antonio, but his baseball career seemed to peter out at this point. On October 28, 1916, Volz married Elsie Boehm, both of whose parents had also emigrated from Germany. They had one son, Jacob Junior, born in 1917, but their son predeceased his parents. On his WWI draft registration card, Volz states his occupation as Fireman, for what appears to be a manufacturing company, though the name of the company is very difficult to decipher. The 1920 United States census reported that Jake’s occupation was "none" while Elsie is listed as a tinsmith. It's likely the enumerator inadvertently transposed the occupations on the census form. Furthermore, the occupation of the person listed two lines above Jake is “Engineer – Candy Factory” - which jibes with the 1900 census for Volz. On the 1930 census, Jacob is listed as a Machinist in a Candy Co. (the family name is indexed as Voltz). Elsie, Jake Jr, William and Louisa are all still there, but Jake Sr. is the only one working. Living with the couple at the time were Jake's brother William, a Pullman porter, and his sister Louisa, a laundress. Volz was survived by his wife Elsie when he died at home on August 11, 1962. This biography can be found in "New Century, New Team: The 1901 Boston Americans" (SABR, 2013), edited by Bill Nowlin. In addition to the sources cited within this biography, the author consulted the subject’s player file and questionnaire at the National Baseball Hall of Fame, the online SABR Encyclopedia, Retrosheet.org, Baseball-Reference.com, and the Encyclopedia of Minor League Baseball. 1 Thanks to Maurice Bouchard for essential genealogical research. 2 “Tale of Two Cities,” Sporting Life, January 14, 1899: 5. 3 T. H. Murnane, “Double Victory,” Boston Globe, September 29, 1901: 6. 4 New England League News,” Sporting Life, November 1, 1902: 8. Some sources show Smith’s middle name as Francis. 5 T. H. Murnane, “Two Shutouts,” Boston Globe, May 14, 1902: 5. 6 Sporting Life, May 16, May 23, and August 8, 1903. 7 Associated Press, “Charge of Murder Against Jake Volz,” Waxahachie Daily Light, May 20, 1911: 1. 8 “Again Postponed,” Houston Post, May 24, 1911: 4. 9 “Insanity Will Be the Plea,” Austin American-Statesman, September 25, 1911; 6. 10 “Jake P. Volz Found Not Guilty,” Galveston Daily News, March 31, 1912: 16. 11 “Obituary,” The Sporting News, August 25, 1962: 40.